Electric cars becoming a reality? 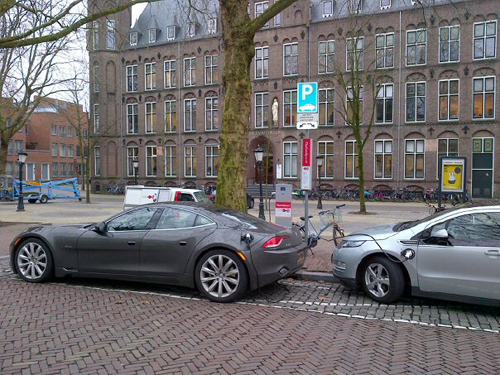 Shortly before Christmas a colleague of mine photographed a busy electric charging point in Utrecht, the Netherlands. Hooked up to the charging point are a Chevy Volt (Opel Ampera in the EU) and a Fisker Karma. Many such charging poles have appeared in London in recent years but I have yet to see anything approaching a “real car” actually using them. On the rare occasion that a charging pole is being used the vehicle is typically the “golf buggy” style electric car, such as the G-Wiz. But if this picture is any indication of a trend, something is certainly happening in the Netherlands. I did find some data on electric car uptake in the Netherlands on another blog site. As of September, there were some 5000 registered vehicles. But the originator of that data now shows nearly 7000 vehicles by the end of November. This is a growth rate of about 10% per month!! Having spent April and May travelling across Europe in my Leaf, I can confirm the strong interest in The Netherlands, Germany and Switzerland, in particular. We found charging points in all, though we usually charged at campsites. There is not usually competition for charging points, though we are beginning to find that in the UK. If you look at the entry in our blog [http://greeneducators.wordpress.com/page/5/] for April 4th you can read about our experience at the Nissan dealership in Leyden in the Netherlands. We put our Leaf on charge, shifting off a fine blue Leaf belonging to the dealership. We then gave way to a Leaf taxi from Amsterdam that had just dropped a passenger off nearly and needed a charge. Electric taxi? Traveling across Europe in Leaf? C’mon these cars are intended for commuting. It is like commuting across the town in SUV. Many people in my office do that but it’s not very clever or environment friendly. What I see as a positive trend is that our bike shed is very busy lately. Perhaps new year resolutions? Soon there might be more bicycles than sport cars around our office.